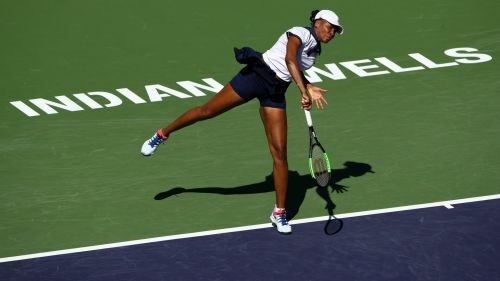 Venus Williams outlasted Andrea Petkovic to reach the second round of the Indian Wells Open, where Kristina Mladenovic earned a meeting with world number one Naomi Osaka. Former world number one Williams overcame Petkovic in three sets on Thursday to set up a showdown with Australian Open runner-up and third seed Petra Kvitova. Mladenovic will have the chance to beat defending champion Osaka for the second time in three weeks after defeating Zheng Saisai. Eugenie Bouchard, meanwhile, fell at the first hurdle following a three-set loss against Kirsten Flipkens at the WTA tournament. In a topsy-turvy contest, Williams edged Petkovic 6-4 0-6 6-3 in the opening round. Playing for the first time since her third-round defeat to Simona Halep at the Australian Open, Williams needed almost two hours to see off the German. Williams – a three-time Indian Wells semi-finalist – broke for a 4-1 lead in the final set and never looked back. "I haven't played in forever, so that was challenging in itself, to get back into competition," said Williams. Frenchwoman and 2017 Indian Wells semi-finalist Mladenovic will face a familiar foe in the second round following her 7-5 6-2 win over Zheng. Mladenovic's 94-minute victory booked her a blockbuster clash with Australian Open champion Osaka after she upstaged the Japanese star at the Dubai Tennis Championships in February. "It's going to be a brand new match. The conditions are completely the opposite to what they were in Dubai: different balls, different surface," Mladenovic said. "I'm sure her game suits well here as the defending champion, and I'm sure she wants to build on some wins again. I'm going to go out there confident, show a fight, and execute as well as I did a few weeks ago." A marathon encounter saw Flipkens eventually beat Bouchard 7-5 3-6 7-5 after two and a half hours. Bouchard save two match points late in the third set but she was unable to stop Flipkens, who claimed her second victory over the Canadian in as many days following Wednesday's doubles triumph. Danielle Collins – the 25th seed – awaits Flipkens.